​On Thursday 2nd November 2017 the RSCO will be hosting a new conductor, Edward Harrisson where we will be playing Beethoven Symphony No 8. Edward studied at the Birmingham Conservatoire from 2004-2013 focusing on Composing and Voice. Edward has a wealth of experience conducting groups such as the Half Circle Singers, New Streetly Youth Orchestra and Boys Make Noise at Catshill Boys School. We are very much looking forward to meeting Edward and have him conducting us. ​"Many thanks for your kind words! 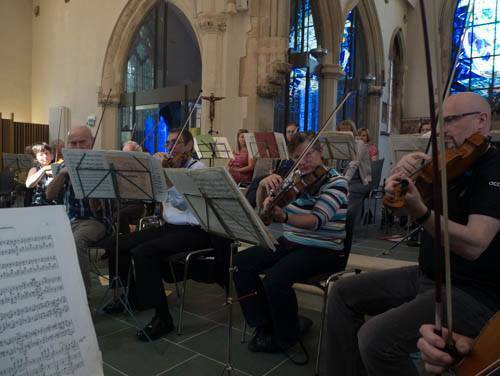 It was an absolutely pleasure performing with Royal Sutton Coldfield orchestra - I felt so at ease and so welcome!" ​"For some days, I had bits of our programme as ‘earworms’ …. sometimes the Bruch, sometimes the Dvorak – and sometimes the Mendelssohn. It was such a memorable concert for me, and I wanted to thank you so much for making it such a happy occasion. As you know, I’ve guest-conducted you for many years, but I can honestly say that this concert, with its weekly rehearsals beforehand, gave me more pleasure than any other. Maybe it was the music we played, but I did feel a special bond throughout our journey – we seemed to grow together through the music. OK – there were some uneven moments on the night, but there were also some great ones, especially in the symphony. (What a great piece that is!)" ​What a fabulous time we had at our Autumn Concert held on Saturday 14th October 2017. It was conducted by the brilliant Malcolm Goldring. ​The Sutton Coldfield Town Hall was packed - in fact, the seats were almost all taken by 7.15pm. The orchestra was on fire opening with Mendelssohn's The Hebrides Overture (Fingal's Cave) Op 26 a cracking piece to open the night of music. The star of the show was Violinist Anna Ovsyanikova, who was our special guest in the concert. She dazzled the packed hall with a phenomenal performance of Bruch's Violin Concerto No 1 in G Minor Op 26. All agreed that this was a beautifully performed concerto. The second half consisted of Dvorak Symphony No 5 in F Major Op 24 a rip roaring piece with superb playing from all sections. After an amazing concert the audience went away humming a host of tunes. Please come back for our sparking Christmas concerts on Sunday 10th December at 4pm and 7.30pm! 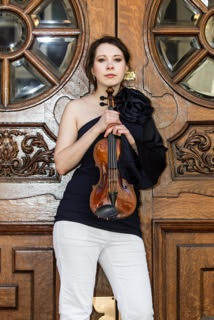 ​Anna Ovsyanikova is a concert violinist regularly performing as a soloist and orchestral musician. Originally from Russia, Anna made her international debut in Germany as soloist with orchestra at the age of 16, and went on to study in the UK, having won full scholarships first for Birmingham Conservatoire and then for the Royal Academy of Music in London where she graduated from the Masters programme with distinction and DipRAM – the highest possible award. She is presently a Royal College of Music Doctoral Bursary holder supported by a Leopold de Rothschild Scholarship. 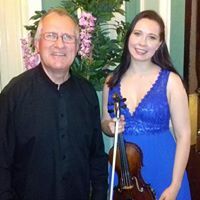 As a recitalist and chamber musician Anna has performed in venues including Wigmore Hall, Cadogan Hall, Royal Festival Hall, Embassy of Russia in the UK, Birmingham Symphony Hall and Birmingham Town Hall. A dedicated orchestral player, she was a concertmaster of all Birmingham Conservatoire orchestras as well as CBSO Youth, Royal Academy Symphony and Concert Orchestras, YMSO and Cheltenham Festival Orchestra. Anna has led orchestras conducted by Sir Simon Rattle, Andris Nelsons and Martyn Brabbins amongst others. She has co-led under Semyon Bychkov, Leif Segerstam and accompanied soloists including Mitsuko Uchida, Julian Lloyd-Webber and Natalia Gutman. Anna has performed with the Royal Opera House, London Contemporary Orchestra, London Philharmonic Orchestra, Welsh National Opera and City of London Sinfonia. In 2010 she was selected to participate in Santander Music Academy where she had masterclasses with Zakhar Bron. During her studies at the Royal Academy of Music her duo partners were Evelyne Berezovsky and Sunwook Kim. As well as performing, Anna teaches at the Junior Guildhall’s String Training Programme. Anna plays on a fine Gobetti violin. ​Malcolm Goldring studied the oboe at the Royal College of Music before continuing postgraduate education studies at the Universities of Durham and Nottingham. His career has been rich and varied, including teaching and lecturing in schools and colleges, Music Inspector for the Metropolitan Borough of Solihull, and Assistant Principal at the Royal Welsh College of Music and Drama. Malcolm has represented juries as a choral adjudicator at home and in Germany, Catalonia, Slovenia, France, Poland and Flanders. 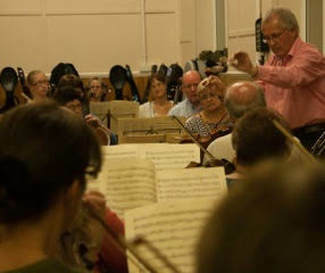 He has conducted many of the major British orchestras, including the Royal Liverpool Philharmonic, BBC Philharmonic, BBC Scottish Symphony Orchestra, Bournemouth Symphony Orchestra, English Symphony and Orchestra of the Swan. He conducted the Philharmonia Orchestra in a major concert at London’s Royal Albert Hall, including Beethoven’s 5th Symphony and ‘The Armed Man’ by Karl Jenkins. In 1990 he was awarded a Winston Churchill Fellowship and as a result toured the United States and Canada studying the development of youth and children’s choirs. On his return he was elected a Fellow of the Royal Society of Arts. His work to support young people singing has been rewarded with an Hon. RSCM (Royal Schools of Church Music). 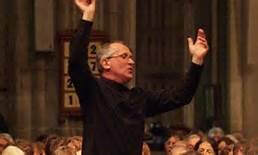 Malcolm is Conductor and Musical Director of the Midland Festival Chorus and the Sitwell Singers, based in Derby. Along with Karl Jenkins, John Rutter and Bob Chilcott, Malcolm is Patron of the Salisbury Community Choir. 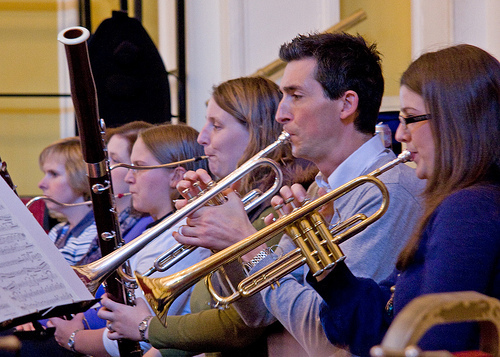 ​It's hard to believe, but the RSCO starts its autumn rehearsals once again on Thursday 31st August. We welcome back Malcolm Goldring, a regular conductor for our orchestra, who will be directing proceedings as we head towards October. Our Autumn concert features perennial favourites such as Mendelssohn's Hebrides Overture and Bruch's sparkling Violin Concerto number 1. Tickets will be on sale soon! In the mean time, if you'd like to find out more about us, click here for the main orchestra or here for our Youth Orchestra! ​Our annual Children's Concert took part in July 2017. This is a great opportunity to showcase not only our main orchestra, but our Youth Section too - all ages playing and performing together is a super way to end the year. The concert included music from The Muppet's, The Pink Panther and Disney Selections - as well as classical favourites such as Mozart's Horn Concerto no. 4 and Stravinsky's finale to The Firebird. We're always looking for new youth members - contact us if you know someone who would like to join us. Rehearsals are every Friday from 4.15-5.30pm at Arthur Terry School. Don't miss our forthcoming Young Soloists' Concert. This is an annual event where talented, young musicians apply for the opportunity to perform part of a concerto with the full orchestra. It' always a sell-out, so don't forget to reserve your tickets as soon as you can! 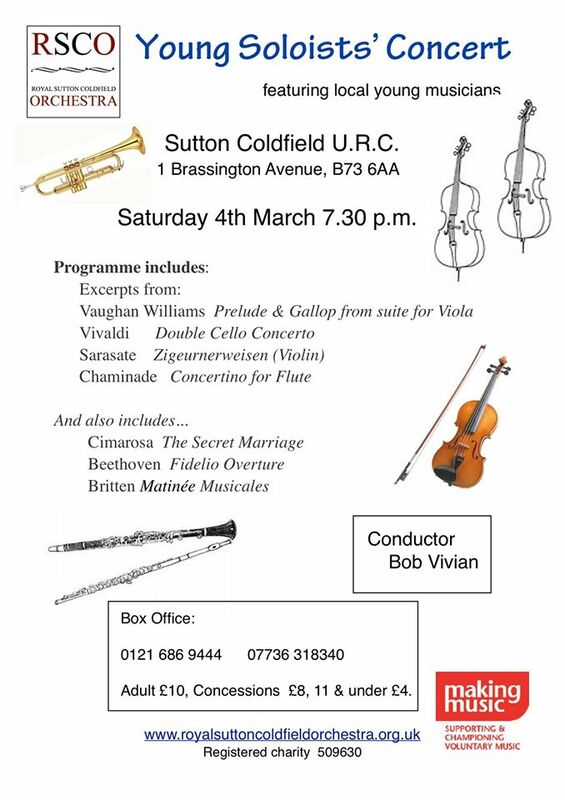 The concert also includes some orchestral music that will top and tail the evening, which will all be conducted by RCO regular Bob Vivian. We look forward to a spectacular evening of musical talent! What superb concerts we had on Sunday 11th December! The RSCO was joined by regular Christmas guests from SC Choirs: The Four Oaks Cluster Choir. The Accidentals also joined the fun this year, and together we performed two fabulous concerts. Both the matinee and the evening performances were sellouts and the Christmas cheer included audience carols and also interval minced pies! Thank you to all who attended - the 2017 Christmas Concerts will take place on Sunday 10th December! A Right Song And Dance! What a superb time we had at our autumn 2016 concert: A Right Song And Dance! It was conducted by Paul Hilliam. On Saturday 15th October the Sutton Coldfield Town Hall was packed - in fact, the seats were almost all taken by 7.15pm. The orchestra was on fire with a host of popular pieces from opera, ballet and the shows - including Tchaikovsky's Swan Lake, Bernstein's West Side Story and the ever popular Danzen No. 2 by Marquez - where the orchestra surprised the audience by standing and dancing as it played certain passages! The star of the show was soprano Helen Williams, who was our special guest in the concert. She dazzled the packed hall with music including Richard Strauss's Four Last Songs, excerpts from The Sound Of Music and the perennial favourite A Nightingale Sang In Berkley Square. After two encores in the second half, the audience went away humming a host of tunes. Please come back for our sparking Christmas concerts on Sunday 11th December! New Term - welcome back! Rehearsals for our October concert start in earnest on Thursday 1st September, at St Michael's Church Hall, Boldmere from 7.30pm. We have a stunning repertoire for this season, which we're entitling 'A Right Song And Dance'. Our music will include excerpts from Tchaikovsky's Swan Lake, Dvorak Slavonic Dances, Selections from Bernstein's West Side Story and Marquez Danzon Number 2. The programme also features guest soloist Helen Williams, who will sing Beim Shlagenden, from Ricard Strauss' Four Last Songs, as well as exerpts from The Sound Of Music and Handel's Ombra Mai Fu. This will be a fabulous concert and tickets are available through this website. Join us for the performance on Saturday 15th October, 7.30pm, at Sutton Coldfield Town Hall. To end the school term, our Youth Orchestra performed their own concert at Four Oaks Methodist Church on Friday 8th July. This gave them an opportunity to choose their programme from a range of music they have been learning over the past year. They also decided that they wanted to use the proceeds of this concert to go towards buying a uniform for the orchestra members! It was a lovely way to end the year - these youngsters have worked so hard and the musicianship has improved immensely in this time. There are always spaces for more members, so any budding young musicians please come and join us on Fridays at Arthur Terry School from 4pm-5.15pm. On Saturday 2nd July, we held our annual Children's Concert, which has proved very popular in recent years. A whole host of fun and inspiring music was performed, ranging from Grieg's Peer Gynt Suite and the theme from Thunderbirds, to Holst's famous Mars from The Planets and Bizet's Habanera. We also tackled the whole of Jabberwokkky - 6 movements of music composed by our President Robert Ramskill, to accompany the famous poem. There was a chance for some audience participation, where youngsters had the chance to come to the front and conduct the orchestra. There were a n umber of budding conductors in fact! Our very own Youth Orchestra also performed as part of this concert, where they sat in with the full orchestra for three pieces. This is always a great opportunity for them, experiencing the force of a full of our adult orchestra! What a hugely successful concert we had on Saturday 21st May. Our Spring Concert was a programme of Classic FM Favourites: Verdi's 'Force Of Destiny Overture'; Rachmaninov's 2nd Piano Concert and Beethoven's 6th Symphony (the Pastoral). 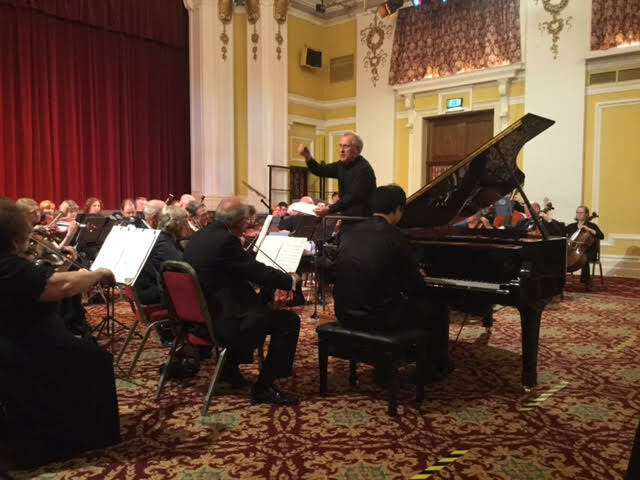 We were lucky enough to have a fabulous soloist - Liang Shan did a superb job of getting to the heart of Rachmaninov's perennially favourite concerto. His expression and emotion was so evident in his playing. 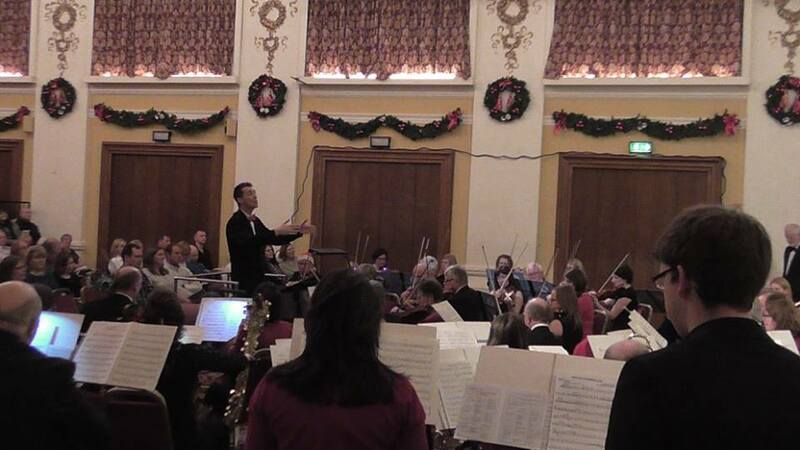 Malcolm Goldring, conductor for this concert, led the orchestra ably and with clear direction. It's always a joy to see him rehearse the orchestra - he has a very clear vision of how the music should be interpreted, bringing out the best in everyone. He still finds time to bring in much humour, too! A great concert all round - and we look forward to working with both Malcolm and Liang again in the future. What a stunning night we had on Saturday 5th March 2016. 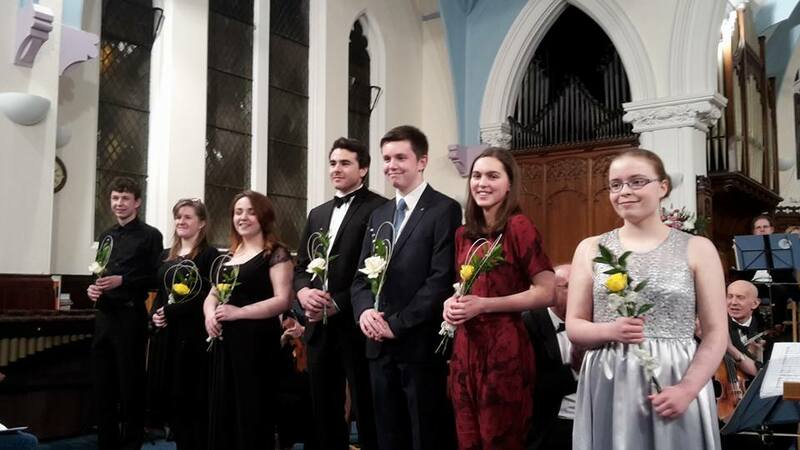 This was our annual Young Soloists' concert, where local talented musicians take to the stage to play a movement from a concerto, accompanied by our orchestra. This has become a firm favourite in the calendar of the RSCO, with the tickets selling like hot cakes. It sure shows that the future of musical talent in Sutton Coldfield and Birmingham in general is safe! The annual Family Christmas Concerts went down a storm. As usual, we were joined by the Sutton Coldfield Musical Theatre Company and the Four Oaks Cluster Choir. There was a whole host of festive (and not so festive) music, with some audience carols to boot too! 40th Anniversary Weekend - one to remember! The weekend of 16th/17th October 2015 - one that marked the 40th Anniversary of the RSCO. We celebrated in style! On the Friday evening, members of the RSCO past and present got together for a special celebratory meal at Fairlawns Hotel. 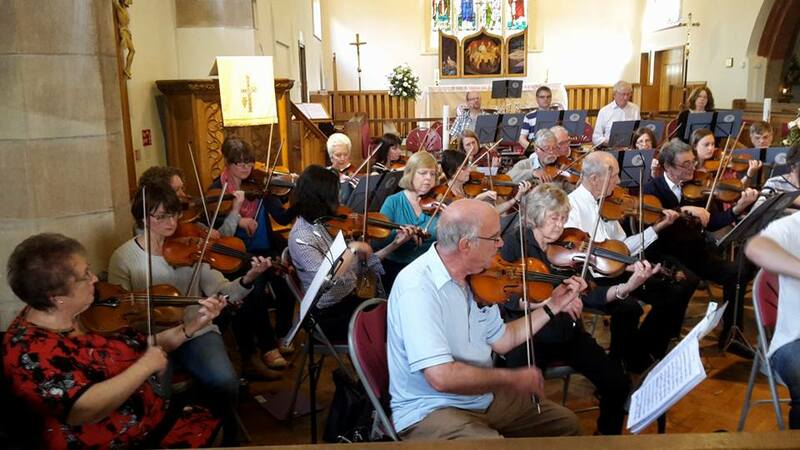 It was a superb mix of people, which also included conductors Malcolm Goldring and Bob Vivian, and founder members - some of which still play for us today. We were also joined by Robert Ramskill, the orchestra's president, and composer of our specially commissioned Anniversary Overture. Wonderful speeches by Kerry Osbourne (a founder member) and Malcolm Goldring (RSCO regular conductor) added a lighter touch to proceedings. Special thanks to Kathryn Sakwa, the orchestra's secretary, for organising the event and ensuring it was a great success. On the Saturday evening, the Anniversary Concert went with a bang! 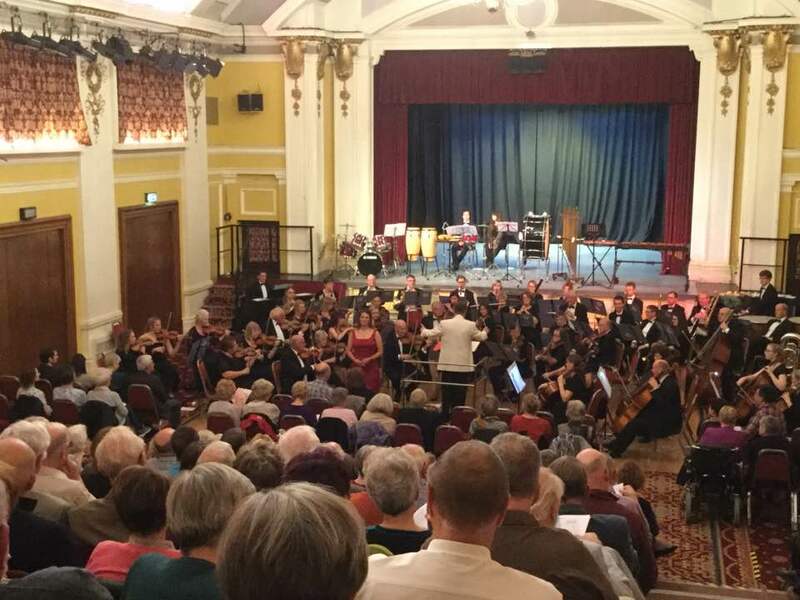 It was a full auditorium at Sutton Coldfield's Town Hall, and the programme was a packed spectacle of Classic Fm favouries, including Dvorak's New World Symphony and Mozart's Clarinet Concert - played by soloist (and founder member) Joy Farrall. She has since become a highly successful recording artist and is a professor at Guildhall School Of music. The programme also included a specially commissioned piece, 'Anniversary Overture' by Robert Ramskill. Conductor Malcolm Goldring, who has also conducted the BBC Philharmic, the Royal Philharmonic and many other leading British orchestra, said: "What a great piece the Anniversary Overture is! It was a great delight to conduct it .... and the other pieces too. The RSCO is such a wonderful orchestra to work with." We are very excited about our forthcoming concert which takes place on Saturday 17th October, at Sutton Coldfield Town hall. It will be a very special occasion because it's our 40th Anniversary and we will be celebrating in style! On the Friday evening, members, past members and friends of the orchestra will be celebrating at Aston Wood Gold Club for a very special dinner. This will be followed, on the Saturday, with a concert to remember - don't miss out on reserving your tickets! Our concert will open with a very special piece: Anniversary Overture. This is a 'world premier' commissioned by and written for this orchestra. Its composer, Robert Ramskill, will be present at the concert - we're very much looking forward to performing this brand new work! Another special feature is our soloist for Mozart's famous and much-loved Clarinet Concerto. Joy Farrall, was once a member of RSCO and was a pupil at the Arthur Terry School. She is now a prolific performer and we are chuffed to welcome her to the stage. Read more about Joy here. Our guest conductor, Malcolm Goldring, is no stranger to RSCO and we are thrilled that he will be leading us in our rehearsals in the run up to the concert itself. The RSCO is proud to announce that it has recently acquired from the Four Oaks Cluster Group, a Youth Orchestra. This is an exciting venture that enables RSCO to offer musical opportunities for children, young people and all ages across North Birmingham and surrounding areas. We anticipate future collaborations, including our annual Children's Concert, featured rehearsals and workshops/tutoring from members of the RSCO. 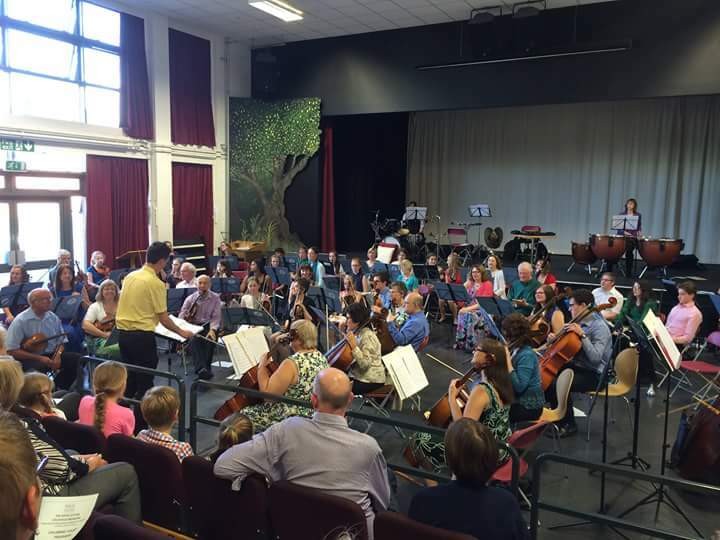 In July 2015 the RSCO hosted its second Children's Concert, which featured players from our new Youth Orchestra. 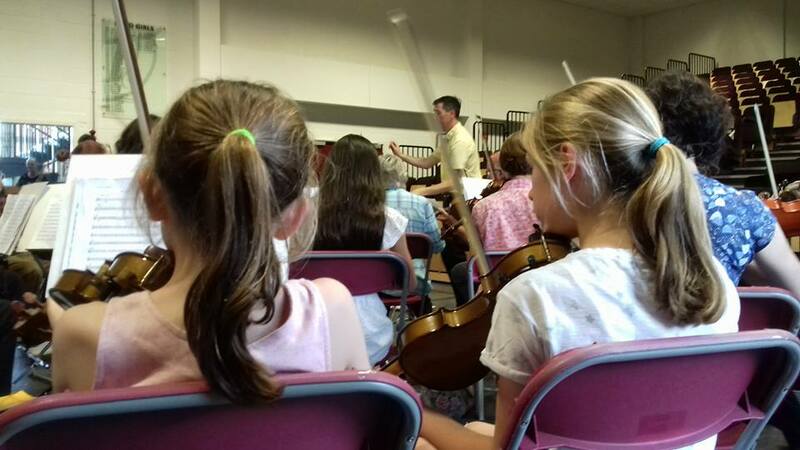 Our young people had been learning 'The Blue Danube' and 'Chariots Of Fire', and this concert enabled them to play these pieces in a full orchestral setting. There was also the opportunity for one or two youngsters to have a go at conducting the famous Blue Peter theme: Barnacle Bill. Other pieces included incidental music to Jabberwocky (with narration by a member of the Youth Orchestra), Peter And The Wolf (narrated by Liz Birch), music from the Lion King and the famous 'Thunder and Lightening Polka' by Strauss.